George E. Miles, 93, of Rumson, passed away Wednesday, Aug. 17, at home. George has made his home in Rumson for the past 47 years. He was a proud graduate of Brooklyn Prep and the University of Notre Dame, where he received his Bachelor's Degree. During World War II, George served as a captain in the U.S. Army, 82nd Airborne, 508th Parachute Infantry from 1942-1946. He jumped on D-Day in Normandy and served in campaigns in Rhineland, the Battle of the Bulge and Central Europe. George was decorated with a Purple Heart, the American Campaign Medal, European African Middle Eastern Campaign Medal w/Bronze Arrowhead, WW II Victory Medal Distinguished Unit Badge. George was the Vice President of Sales for Milton Can Company, Elizabeth when he retired in 1987 after 25 years of service. He was a parishioner of Holy Cross Roman Catholic Church, Rumson. He was involved with Little League Baseball, a former member of the Rumson Fair Haven Board of Education and the Deal Country Club, and well-known for filming swim meets at Peninsula House Beach Club. 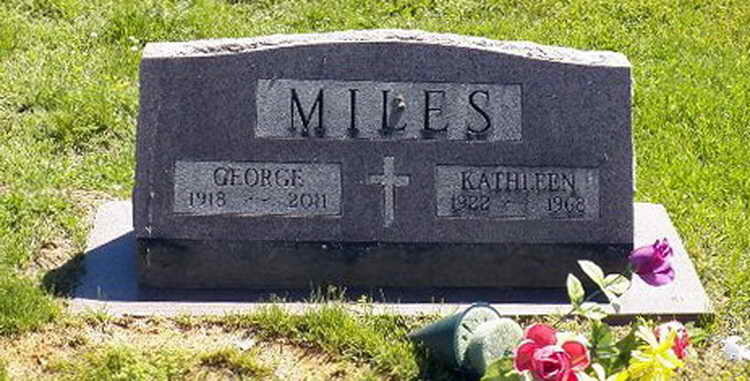 George was predeceased by his first wife, Kathleen Kelly Miles; his second wife, Elsie Dalton Miles; a son, Michael Miles; brother, Thomas Miles; and a sister, Marilyn Miles. He is survived by two sons, George A. and wife Nancy of Branford, Conn., and Daniel K. and wife Ellen of Rumson; four daughters, Kathleen and husband Joseph Blackwell of Leonardo, Julia Miles of Acton, Mass., Dolores Miles and husband James Lackey of Maplewood, and Madeleine and husband Gregory Holland of Colts Neck; two step-daughters, Alice and husband Richard McKee of Kingsport, Tenn., and Betty and husband Jerry Watts of Bellflower, Calif.; and 17 grandchildren, George, Kevin, Gregory, Dan, Maggie, Bridget, Michael, Sam, Miles, Nicole, Kathryn, Brendan, Erin, Casey, Carly, Tricia and Meghan. Visitation will be from 6 to 9 p.m. Friday, Aug. 19 at the Thompson Memorial Home, 310 Broad St., Red Bank. A Mass of Christian Burial will be celebrated at 10 a.m. Saturday, Aug. 20 at Holy Cross Church, 30 Ward Ave., Rumson. Interment will follow at Mt. Olivet Cemetery, Middletown. Grave marker for George E. Miles and his first wife, Kathleen, in the Mt. Olivet Cemetery, Middletown. New Jersey. George served with the 508th PIR from early 1942 as a 2nd Lieutenant rising to the rank of Captain. At various times he was assigned to Headquarters Company, 2nd battalion, Company E and Service Company in various capacities. He was wounded in action on 13 June 1944 in Normandy, France and was hospitalized for nearly two months recuperating from wounds in both legs. Captain Miles received the Purple Heart, Combat Infantryman badge and the Bronze Service Arrowhead device for action during the Normandy, France Campaign, 6 June 1944 to 9 July 1944.